In the PCT desert areas, I had four plastic water bottles clipped to my pack belt. For hikers who use a different hydration system, such as CamelBak, the clip may not be appealing, but I’ve seen even these folks carrying a spare bottle. I think most long-distance hikers go with plastic bottles to reduce pack weight. Other hikers may stick with canteens, or use wide mouth Nalgene bottles. Use whatever works for you, but a clip like this is light, inexpensive, easy, and convenient. That’s also true for the common plastic bottle. I was able to order these “Quick Draw Bottle Clips” right off the internet. But now the site has disappeared. I did see them in a hiking store in New Hampshire. If anyone out there knows of a new web site, please alert me. A couple of years ago, an injured hiker was rescued after spending three nights on Mt. Hood in Oregon. At the same time on the East Coast, it took rescuers nine hours to bring an injured hiker to safety after he fell on a Maine mountain. More and more, we hear these stories. Why? Some believe that the ubiquitous cell phone lends a false sense of security to hikers. The cell phone is the first line of defense for the backpacker who thinks he can rely on that more than maps, extra clothing, water, nourishment. Hikers forget that most cell phones don’t work in the mountains. Also, with hiking and backpacking a growing interest, there are more hikers out there. And many of them haven’t taken the time to learn the basics, what to pack, how to handle bad weather, how to read field maps, how to prepare a backup plan, etc. We aren’t given every detail in the first incident referred to above, but according to the article the young woman is an avid hiker who “ate berries and bugs and covered herself with moss to stay warm.” She deserves a lot of credit for surviving, but here’s the thing: She was found wearing only a T-shirt and shorts! True, she became separated from her boyfriend after dropping her gear to look for a better campsite, but when they got out of shouting range, it may have been a good time for her to go back and get her pack. In the second incident referred to, an experienced hiker fell off a mountain on the Appalachian Trail in Maine. He was injured and couldn’t move but, luckily, was able to call for help with his cell. Unfortunately, he was three miles from the nearest road. We aren’t given all the details here, either, but it appears that he was hiking with just one other person, his niece. I’ve hiked alone, but not anymore. And you always put an outing at risk when you hike with just one other person who is dependent on you, especially if you can’t get your cell phone to work. What could his niece have done then? She would have had to leave him and tramp on alone to try to get help. Another risk. Not only is it safer, it’s more fun to hike with a group. You learn things, and you’re ready to help others. So, study your maps; prepare, pack smartly, and stay alert; hike with friends. 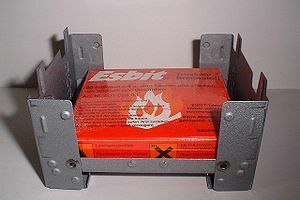 The Esbit Pocket Stove continues to be a well-kept secret. I have no idea why hikers who try to shave every fraction of an ounce from their pack, ignore the mighty little Esbit. This dependable tiny stove, which can fit in your pocket, has been used around the world since WW II. TIP: To reduce pack weight and increase pack space, get a tiny stove. I’ve used the larger, quick-firing stoves that require liquid fuel. I admit those stoves probably work better for serving several people, especially if you are in a hurry. Their “simmer” advantage is also convenient. However, the Esbit is always reliable, and it will never clog. Most of all, it’s small and light! I remember on the A.T. having to clean and maintain my high-end stove; having to watch my fuel–hoping it lasted until the next supply stop, then over-supplying and hauling extra, bulky canisters. Yes, stoves have gotten smaller and better. But the Esbit is one of the simplest, easiest, most reliable stoves out there. What’s more, the fuel for the Esbit is portion controlled; it uses little fuel tabs that you unwrap and place on the floor of the stove. One tab will cook your meal. I sometimes light two and re-use them the next time, as shown in the picture. The Esbit provides a foolproof system for cooking in the wilds. Check it out.